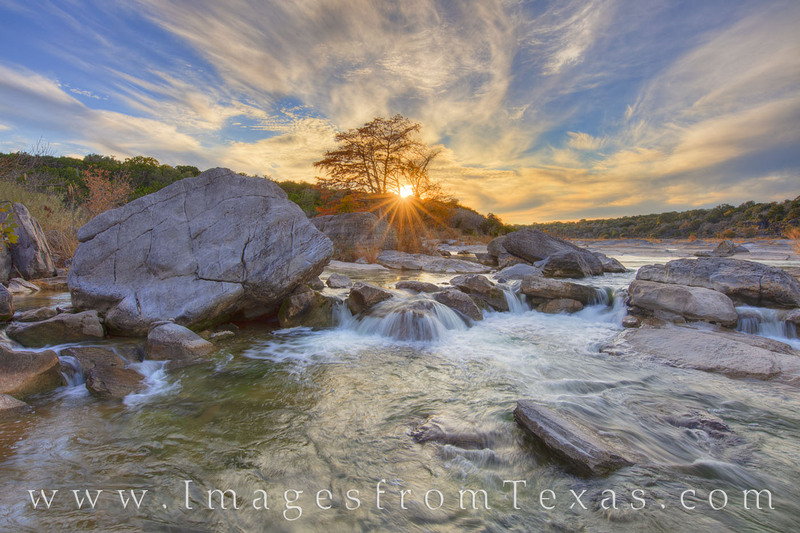 This cold November evening along the Pedernales River offered a beautiful and unexpected. For most of the afternoon, the clouds were thick, offering only glimpses of blue sky.But I found this little waterfall and waited, hoping for the best. I had to cross several overflows of the river to reach ths point, and after several nights of sub-freezing temperatures in the Hill Country, I assure you the water was very cold. Eventually, I regained feeling in my toes whlie sitting atop a rock in the middle of the stream. The sun peeked through the orange cypress tree and the sky seemed to glow orange and blue for a few minutes. Soon, the light show was over and I was left to navigate across the cold-flowing water again, bringing an end to a beautiful Autumn day along one of my favorite places in Texas. Photo © copyright by Rob Greebon.